3 or more only $12.00 each! Beautiful and sharp right outta the box. Bigger than I thought it would be! Very tight, can't open with one hand, takes a while to loosen up. Overall great quality for the money. Despite other comments I've read here, mine was truly razor sharp! (Made a large bald spot on my arm) Also it is very beautiful and well made. I'm very happy with this item. Very Pleased. Needs a razor strop for fine sharpining. Well made. The razor came just about as dull as a butter knife. I found it difficult enough to cut even one strand of hair with let alone use it for shaving. After a good sharpening its decent but i still need to buy a strop. The razor is very hard to open and forces you to grab the blade to open it. It was nice that it comes with the draw string pouch but from the way it feels it cost about 5 cents. 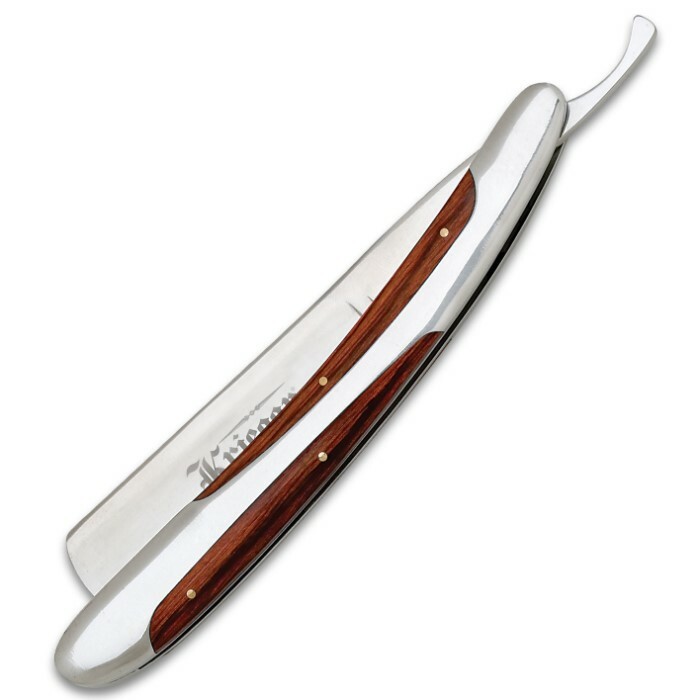 For the price you cant really complain and with a little bit of work it can be a decent razor. this thing is gorgeous, elegant, and simply stylish every bit of perfect. That old world shave is just seconds away. 10 of 10. I wish the scale went to GREAT. 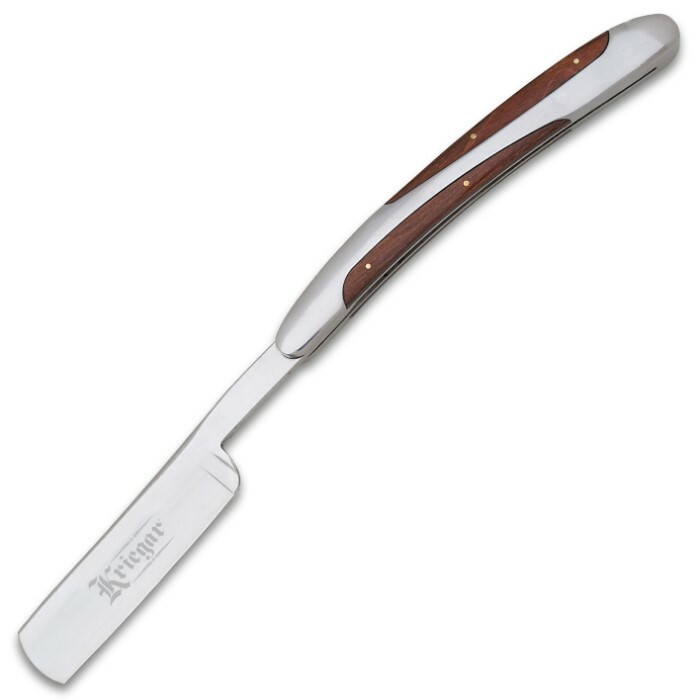 I got straight-razor shaves while travelling in Asia, and loved them - for which I decided (beside saving money and the environment) to lay out for a straight-razor. My recommendations for those following my path: #1) SHARPEN, HONE, STRAIGHTEN, STROP. Out-of-the-box, for my beard at least, this blade simply isn't sharp enough. If you can find and afford it, I recommend getting a proper bevel; at least you should lay out for a stone-grind sharpening kit, a straightening steel and a strop to make sure you cut chin-whiskers, not arteries. 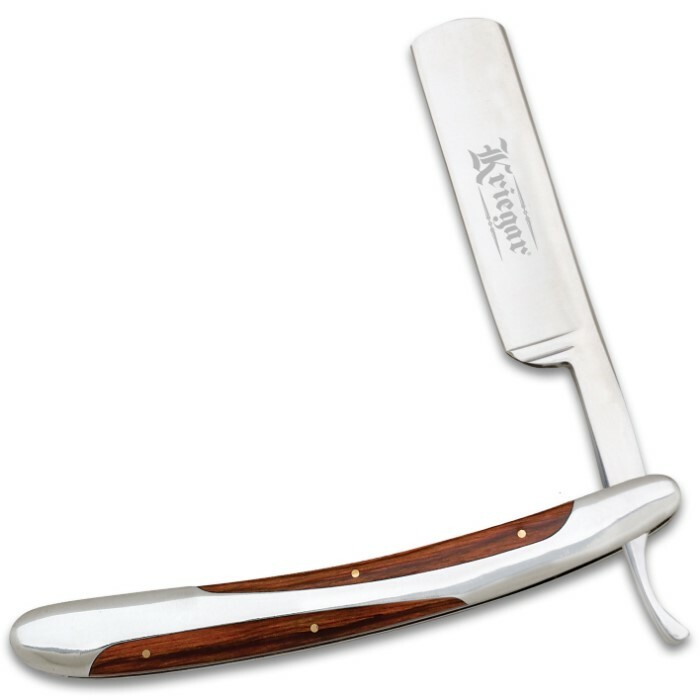 It's an investment - think of how much you spend on safety-razors each year, and I bet you'll find it cheaper to switch to the straight-razor. If you shave daily, I'd recommend honing the edge every 3-6 months. #2) PAY FOR THE PROPER LATHER. Shave after a hot shower, or use a hot towel for a couple minutes before you shave. Lay out for the proper shaving soaps, not that canned #!$% at the store. Pre- and post-shave oils or after-shave (I like a scented linseed oil) will make sure you've got a face as smooth as a baby's bottom and a helluva lot sweeter-smellin'. You may not even need to shave every day. #3) Patience, PATIENCE, *PATIENCE. * Think of every time you shave as an opportunity to learn about your face and skin, your straight-razor, and yourself - the same as learning a[n martial] art. 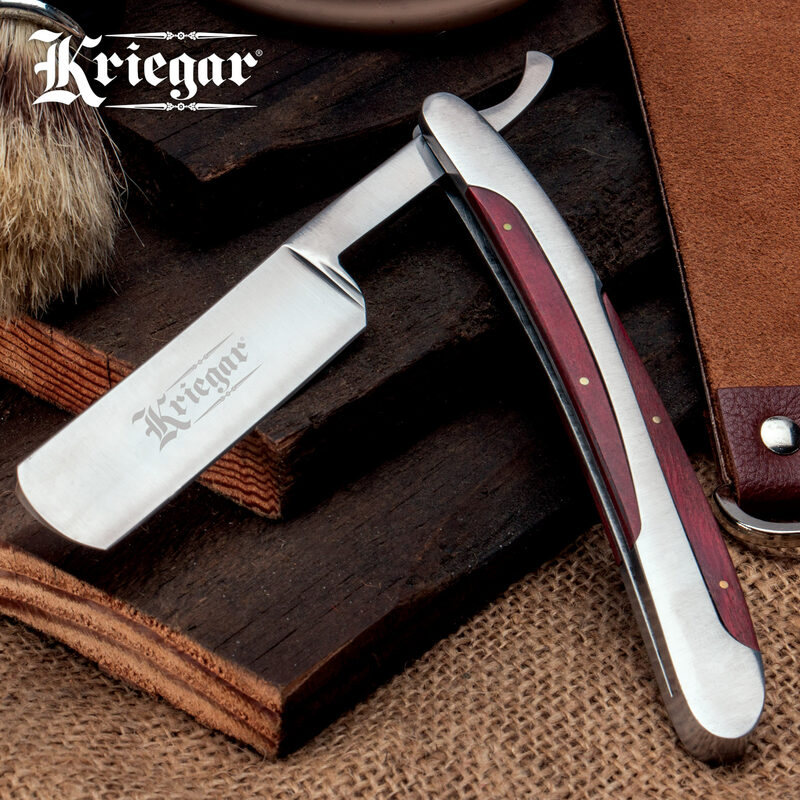 It took you lots and lots of practice to [fill in your particular skill here] - using a straight-razor, like your grandfather or great-grandfather did, is no different. I promise you will come to love it, and I guarantee that if you do, your beloved Kriegar pakawood razor will be the same blade to glide across your grandchildrens', great-grandchildrens' chins. Very nice blade, but not sharp enough to shave. 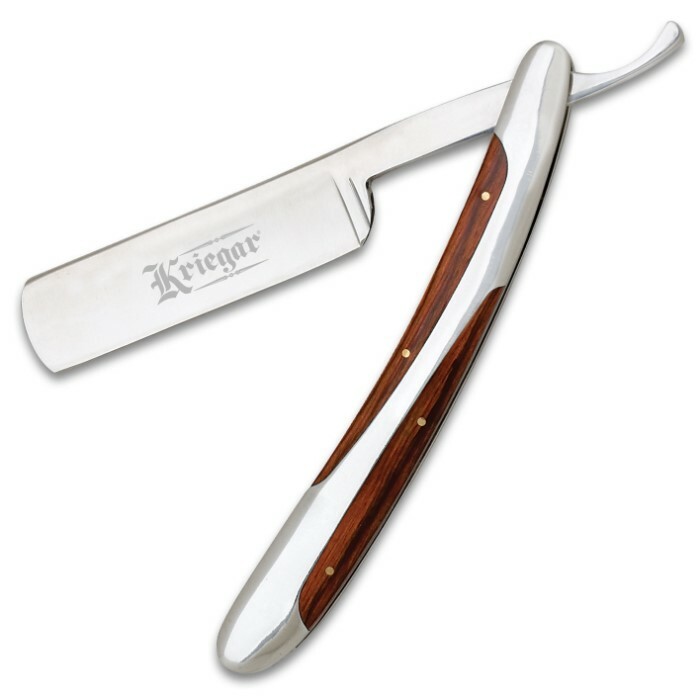 very sturdy razor and appears to be able to hold a sharp edge. Came very sharp right out of the box. Very happy. Cool design and it fits into my mini mag flashlight case if I want to carry it on my belt. Always gets people attention when I do! Get one for yourself!